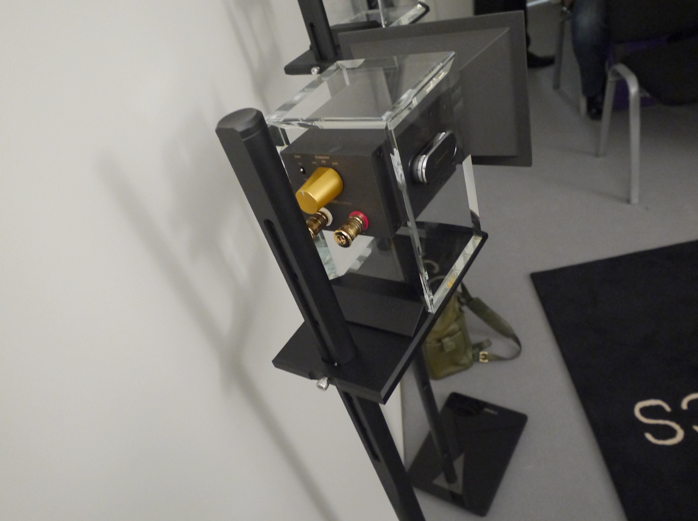 Making decent sound in show organizer Branko Glisovic's ground-floor cubicles is—cough—challenging. Check out the travesty below. Ceiling tiles. Thin flexing walls. The anti works. 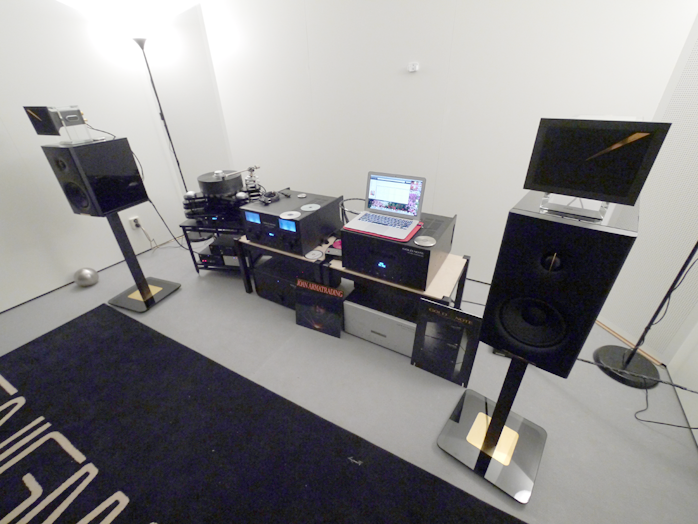 Hence soundkaos built their own. 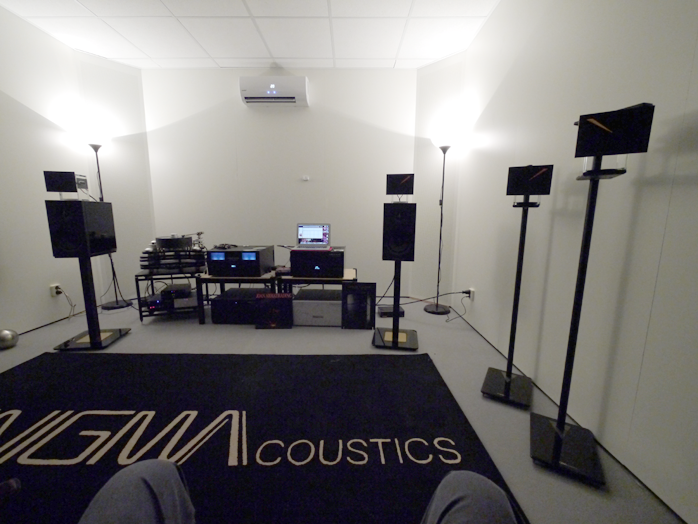 Like everyone else, EnigmAcoustics stuck with their allotted stock space but still produced the very best hifi sound I encountered on that floor. Such a sound produces a far better top end than you'd ever hear at any amplified concert; and still better than at an acoustic concert unless you sat at extreme proximity to the musicians. For playback this artifice fills in some of the gaps which are created by subtracting all visual data from our recordings (without video). Here Enigma's self-biased nano-coated ESL super tweeter acts as an ambient restoration device of demonstrable before/after effectiveness. 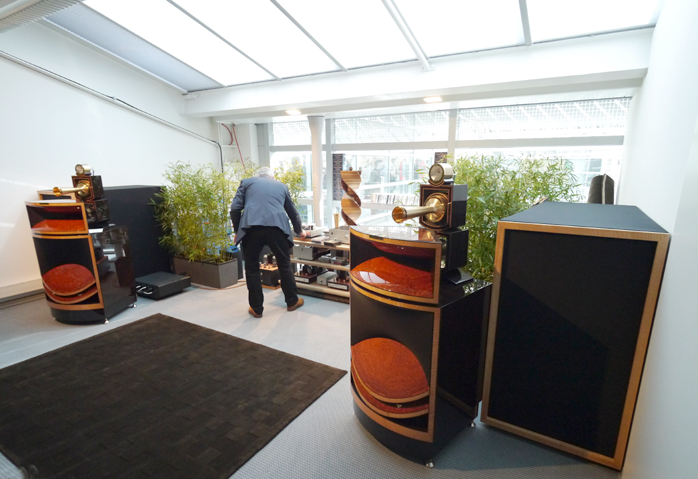 The HifiPig folks had experienced that demo and gushed over it during our impromptu meet. I'd of course reviewed the speaker system before the show to already know. To encourage Sopranino's use with speakers without a flat top (or which are so tall that the super tweeter would fire from far too high), the company have now authored this optional stand. Its platform can be fixed with one bolt to seven different points along the rear-facing channel. Whilst the Sopranino is far from cheap, it is the perhaps most effective such device I've come across. With the new stands there's no excuse left not to enjoy these add-on tweeters if you can afford them. Another manufacturer also on the ground floor was Stavros Danos from Aries Cerat of Cyprus. It took great effort to find him. I'd walked past without knowing more than once. I had to finally consult the bloody map and memorize row and number. And Stavros clearly hadn't gotten the memo that small is in and huge so very 20th century. This is an example of a clearly very gifted designer being the only one in love with his gear. Who else would tolerate such gigantic valve kit in their living room? Or such a cosmetically odd speaker? Stavros had missed that other memo too; about not letting crossover parts 'hang out' regardless of audiophile pedigree and geek factor. Women in particular despise that look. Having owned his Gladius speakers to have many phone calls with him under my belt, I'm amazed by how stubbornly he pursues his gigantomaniac path in the face of the economic realities of his island nation. Some people are in business to sell and thereby serve their customers. Others make things solely to please themselves. Which is peachy if you can afford to. Just don't you dare complain about lack of sales. In this case that's a crying shame. Seeking out Stavros' Greek colleague Manolis Proestakis of Tune Audio became the reminder. 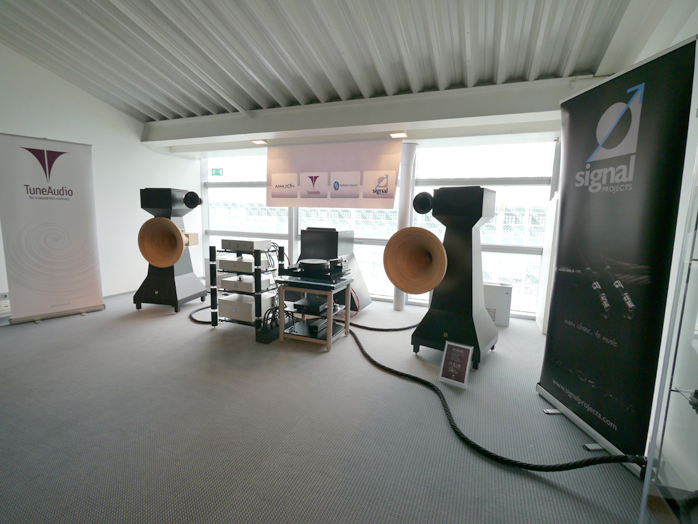 Having heard his 109dB efficient Anima hornspeakers in the same room three times over the years, the first showing with Aries Cerat electronics had been truly memorable and goose-bump inducing. 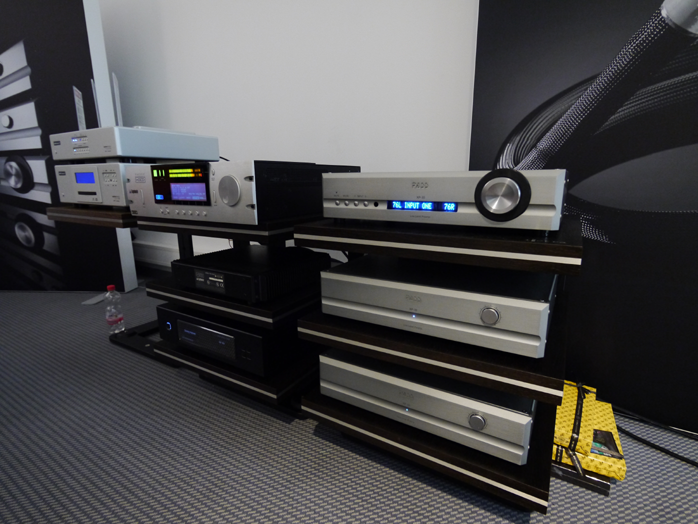 Last year's match with the Swedish Lars and French TotalDAC electronics had been plainly inferior - pale and whitish by contrast. 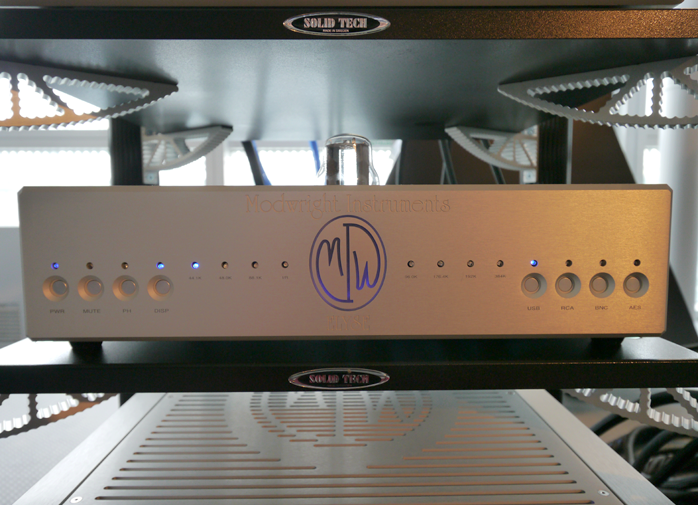 This year's team work with ModWright Audio had much improved density and substance but not reclaimed that effervescent first magic or wow factor. Manolis agreed. Showing solo was simply too costly particularly considering the Greek economy. It's likely that the massive ModWright transistor amp overdamped his light-membrane drivers with their powerful motors a bit. Knowing what the Anima were capable of, I wasn't troubled. This still was very fine musical and very meaty sound like Boenicke and soundkaos, simply scaled up for a bigger space. It only lacked ultimate resolution and airiness (i.e. some 'hifi sound' qualities which one ultimately hopes to clone atop the mandatory musical foundation of tone mass and dynamics). Dan Wright's gear of course was dead quiet into these noise-tracking transducers to credit his consummate design chops. 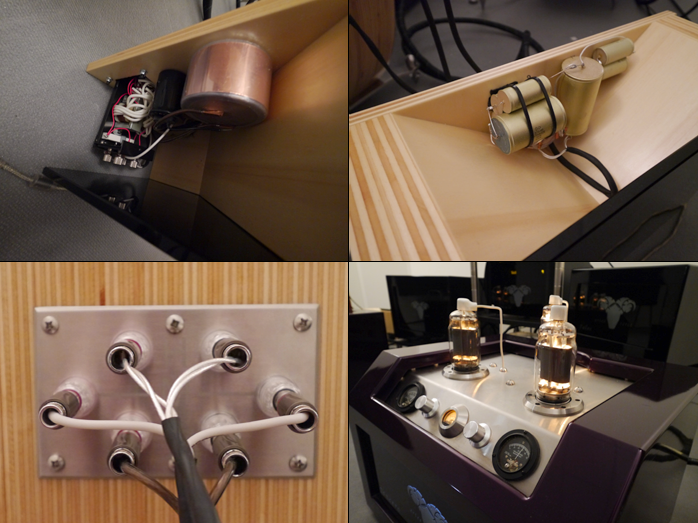 Here are front and aft photos of his new Elyse fully tubed D/A converter which I'll review later in the year. 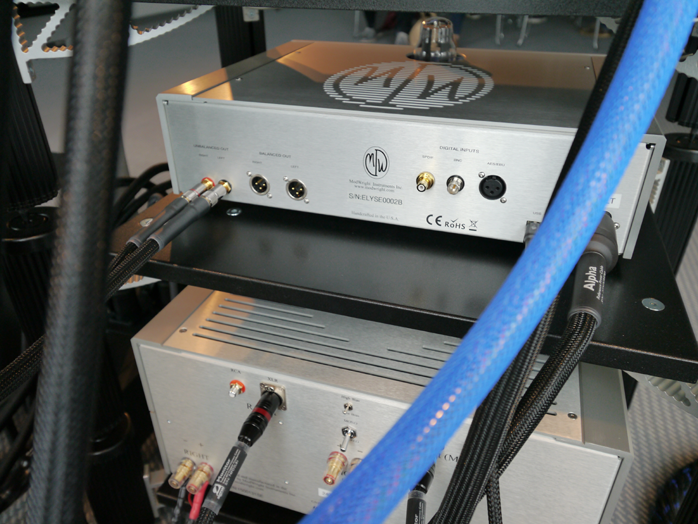 As you can see, it offers AES/EBU, coax, BNC and USB inputs and RCA/XLR out. 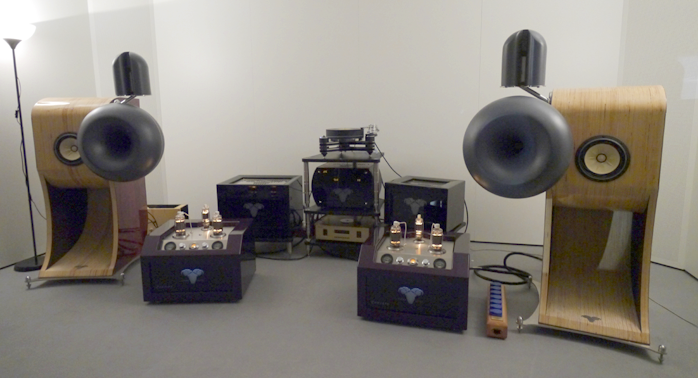 A very big disappointment were the ~$600'000/pr Magico Ultimate horns. By blocking off the room's front with a temporary wall and two small openings on either side for visitors to enter and leave, the effective seating area in this space had been moved forward. Perhaps this left insufficient distance for the drivers to cohere particularly in the front row where I sat? Whatever the reason, the soundstage was vertically fractured into splices. This betrayed different drivers with different radiation patterns never working as one. Returning on a later day to now stand farther away, things still didn't click. This was bad hifi sound at its best - hard, unnatural and mere effects. Since Alon Wolf had been in the same space for years, one clearly couldn't blame the room. He knew well upfront what he'd be dealing with. As one attendee put it, "if you're letting your one-eyed appendage hang out in public, you better be damn sure it's a fine saucy specimen". This wasn't. Meanwhile by day two of the show, Living Voice had reclaimed last year's top spot as the über system which relegated justifying expense and excess to somewhere well removed from the actual experience. Most of us could never afford this kit. Yet that so wasn't in the foreground of any discussion. Instead this was proof of concept on what the true high-end is ultimately capable of. Concept cars aren't realistic either. Except that in this instance some well-off clients will actually drive one. The only physical thing different from last year was chemistry. Kevin Scott's battery bank had undergone changes. 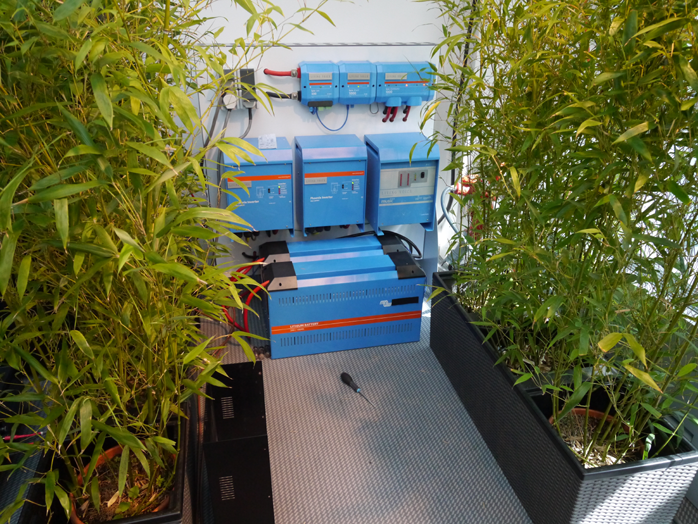 Certain cells now exploited a different chemical composition which our man was quick to credit. The big Living Voice Avatar model code-named OSX had been expected to play too. 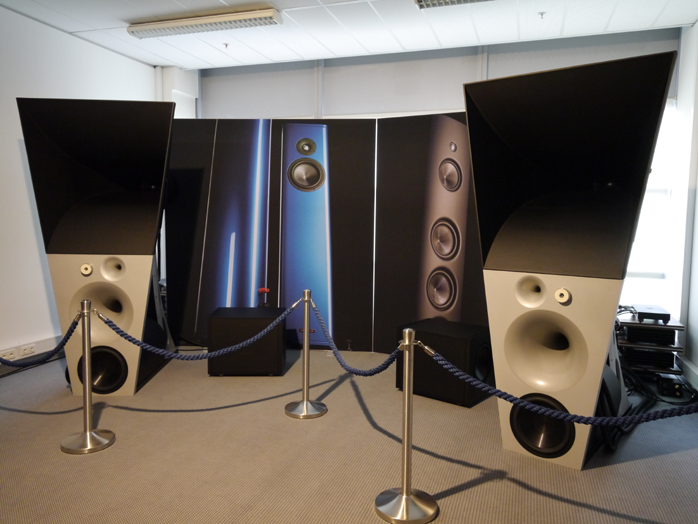 It had been fully finalized as a design and prototype—8" d'Appolito two-way with diagonally upfiring rear-facing ambient compression tweeter—but not been on time for first production. I've been promised a review sample for later in the year though. 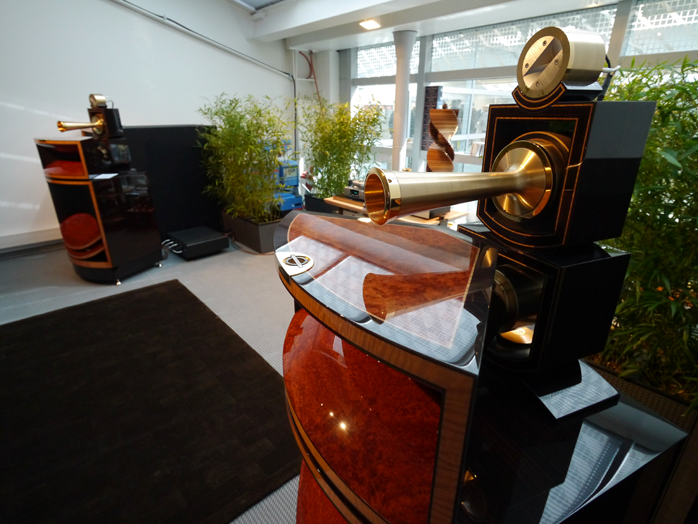 Back on the Vox Olympian and Elysian system, two of these had found permanent homes in the UK and Austria last year. Another four looked to be shaping up for 2014. With production seriously limited because it involves painfully protracted wood-finishing labour (I seem to recall 600 hours per speaker), at this rate the company might well experience a waiting list for their most ambitious effort. Again, this was the room to calibrate one's reference on what's possible.